Place the maple syrup, coconut oil and vanilla extract in a pan set on a medium heat and stir occasionally, until the oil has melted. Place the desiccated coconut, ground almonds and a pinch of salt in a mixing bowl and stir to combine. Once the coconut oil mixture has all melted together, add it to the dry ingredients and mix thoroughly. Place a sheet of non-stick baking paper on a baking tray, ensuring the tray is small enough to fit in your freezer. 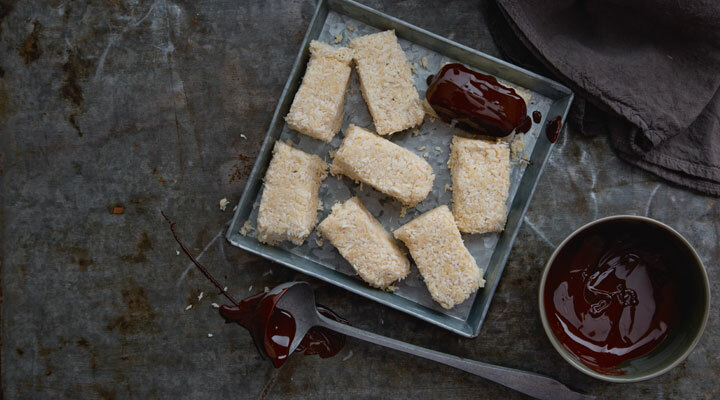 Spread the coconut mixture onto the lined tray and form it into a square roughly 10cm x 10cm and 2.5cm high. Place the baking tray in the freezer for 20 minutes to harden. Meanwhile, place the chocolate in a heatproof glass bowl set on top of a pot of boiling water, making a bain marie. Just make sure the bottom of the bowl doesn’t touch the water. Stir occasionally until it melts to a nice consistency. Alternatively, you could melt the chocolate in the microwave. After 20 minutes the coconut mixture should now be firm enough to cut into solid bars. Place the square on a cutting board and cut into 12 squares with a large knife. Use a ladle to pour the melted chocolate over each bar, turn them over to coat the entire bar. Place the chocolate-covered bars back on the lined baking tray. Pop them in the fridge for 10 to 15 minutes to allow the chocolate to cool and harden.